Mumbai, May 22, 2015 - Prystine Food & Beverages Pvt Ltd (www.prystine.in), a premium functional beverage company, announced the launch of its exotic range of fine luxury artesian water, Blue Pine (www.bluepine.in). Named after the coniferous evergreen tree native to the Himalayas, Blue Pine fine luxury artesian water is sourced directly from a confined aquifer which lies more than 100 meters below the Trishul mountain range. Hundreds of miles away from the nearest industrial landmass and surrounded by rich bio-diverse forest preserves, Blue Pine fine luxury artesian water originates in the western base of the Himalayas in the Kumaun region. 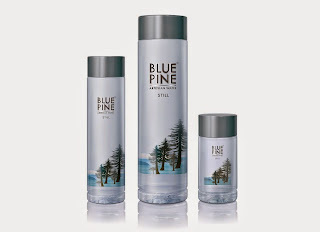 Naturally enriched with high amounts of vital organic minerals, Blue Pine makes its way through varying geological rocks that act as a natural purifying filter and also imbue it with a unique blend of natural minerals which lends it its distinct taste. The transparent disposable bottle embodies the pure origins of artesian water and represents tradition, quality and purity. Recognizing that the product, characterized by its high quality, should not be hidden by its packaging, the Blue Pine bottle label captures the essence of the product – artesian water - in clear focus. The label’s foil is transparent, allowing attention to be drawn not exclusively to the label, but rather to the rich and pure artesian water. With the Trishul Mountain imagery, where the water originates, on the back of the label, the design gives the landscape a three-dimensional appearance, making for a dynamic fine luxury product. Priced at Rs. 60 for a 1000 ml bottle, Blue Pine is available in exquisitely designed sleek, crystal clear bio-degradable bottles in broad range of sizes that include 1000ml, 500ml and 250ml. Blue Pine is the preferred choice for the discerning consumers wanting premium water to complement their dining experience. The range is available at fine dining restaurants, cafés, bars and at all leading supermarkets, hypermarkets, chemists and high end neighbourhood grocery shops across Mumbai, Delhi NCR, Pune, Ahmedabad, Goa, Chandigarh, Noida, Jalandhar and Hyderabad. Headquartered in Mumbai, Prystine Food & Beverages Pvt. Ltd. is a premium non-alcoholic beverage company that produces a variety of waters, tonic waters and other beverages. These 100% shelf stable beverages are available in a variety of packaging formats and sizes. Prystine’s offering includes: Blue Pine (arguably India’s only artesian water) in Still, (soon to be launched - Sparkling & FruitAqua). Prystine Packaged Drinking Water, Prystine Lounge Myx – Club Soda, Tonic Water, Mojito, Margarita, Cosmopolitan, Caipirinha, and Gingerale.